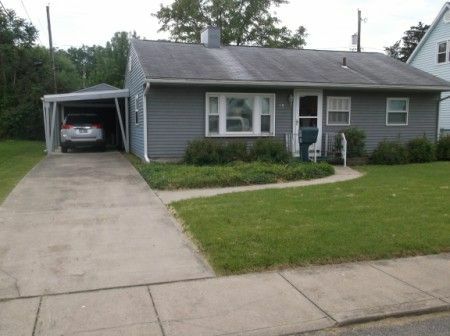 Being a one floor plan vinyl sided 3 bedroom and bath home w/detached one and a half car garage. Home offers step-saver kitchen with top and bottom wood cabinetry, electric range, refrigerator and computer area. The living room has carpet & picture window; utility room with washer & dryer hookups. 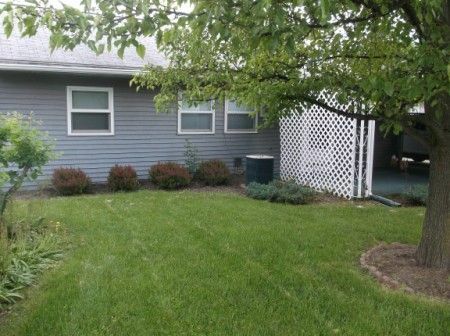 A real attraction to this home is the rear covered, carpeted patio…it would be a great place to enjoy the outdoors! Home as replacement windows, gas LENOX PULSE high efficiency furnace, central air conditioning, city water & sewer, shingle roof…all this on a nicely landscaped 54’ x 95’level lot. Real Estate Terms: Terms: $25,000 Minimum Bid; $5,000 down in cash or check w/photo ID day of sale w/balance & possession upon delivery of deed on/before August 24, 2013; being offered free & clear of liens or mortgages prior to closing; sold in present as-is condition, no buyer contingencies exist. All information provided is to be utilized only as a guide. Buyers are responsible to conduct any inspection, inquiry, investigations and due diligence regarding to property. Buyer agrees and understands that the seller makes no warranties or representations of any kind either expressed or implied as to the condition, quality, and merchant ability of fitness for a particular purpose of the real estate or any part thereof and/or serviceability for the same. Buyer is buying property subject to any and all easements, leases, covenants and restrictions. The agreement of auction is solely between buyer & seller. Stanley & Son, Inc. and its agents are exclusive agents of the seller. Taxes & Legal: Taxes are Homestead $705.14 & will be prorated to closing date.Ross Co. Parcel No. 305220014000; Vol. 0317, Pg. 0013; Agents for Willard W. McCarty, Atty-In-Fact for Garnet M. McCarty, Richard W. Delong, Atty.